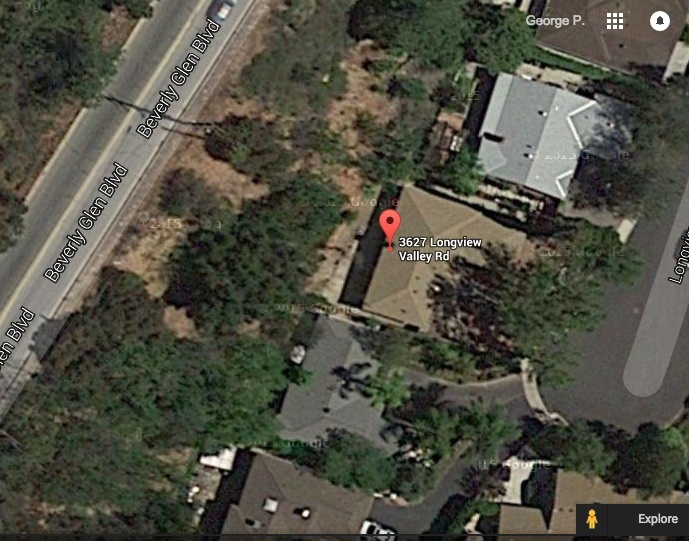 After the murders on Cielo Drive the killers turned up Benedict Canyon Blvd. to return to Spahn's Movie Ranch. After crossing Mulholland Drive on the crest of the Santa Monica mountains they turned north on to Beverly Glen Blvd. and began their descent into the San Fernando Valley. 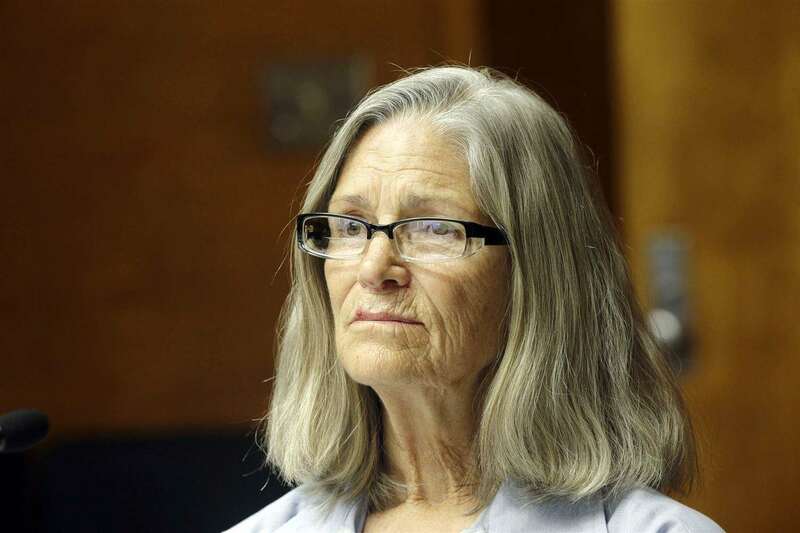 Soon after starting down the hill Linda Kasabian threw the .22 caliber High Standard Buntline revolver used in the killings out of the car's window. The gun went over the side of a hill and landed on an embankment leading down to the back yard of the Bernard Weiss residence where it was found by son Steven Weiss while he was working on a sprinkler fixture on September 1, 1969. 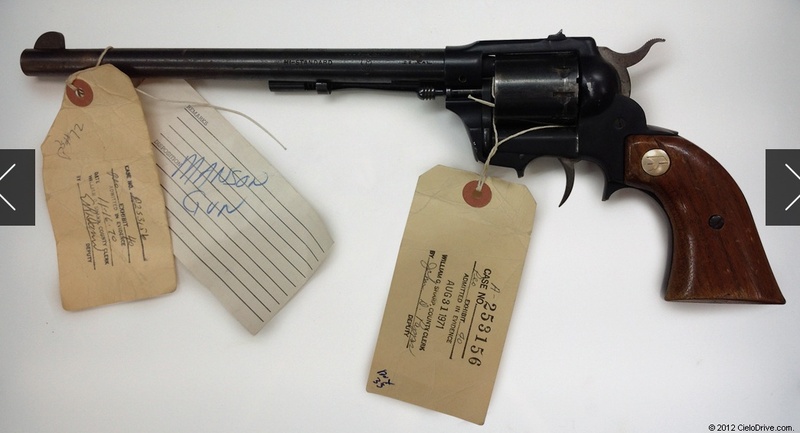 The gun was turned over to police the same day, but no connection was made between the weapon and the murders for over two months. and Beverly Glen Blvd. behind and above it. how close to the Weiss house Beverly Glen Blvd. is. The property has a very small back yard. On tour day the house was seemingly vacant and being made ready for repairs, so we were able to explore it completely, even venturing into the back yard. The house practically abutted the hillside behind it, but someone in a car on Beverly Glen at night would likely not have been aware that there was a neighborhood and houses situated so closely to where the gun was tossed out. Jane Doe #59 found Nov. 16, 1969 in LA County on Mulholland Drive has finally been identified. Los Angeles police have identified the body of a woman found stabbed 150 times in 1969 near the site of the Manson family killings as a 19-year-old from Montreal, People magazine reported Wednesday. Police have identified the woman as Reet Jurvetson, who moved to Los Angeles from Montreal the year she was killed, according to People. Los Angeles police Detective Luis Rivera told the magazine that investigators can't rule out that the Manson family was involved in the killing. 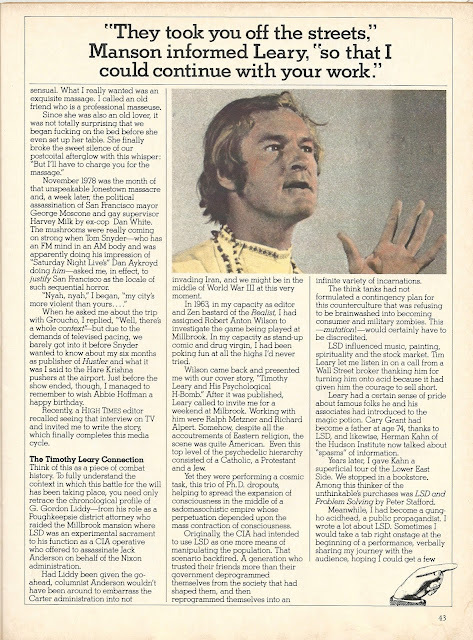 He said the best lead police have is a man known as "John," whom Jurvetson met in Toronto before flying to Los Angeles to see him the summer of 1969. Jurvetson's body was found Nov. 16, 1969, by a birdwatcher in dense brush off the iconic Mulholland Drive. She had been stabbed 150 times and didn't have identification. "It was personal," Rivera told People. "It was a maniac ... or love gone wrong." After going unidentified for years, Jurvetson eventually became known Jane Doe No. 59. 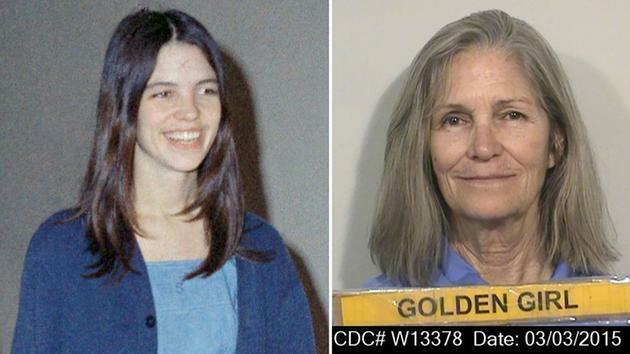 The location and timing of her killing, just a few miles away from several Manson family murders, has long fueled speculation that Jurvetson's case was connected. Police are working to solve the murder, with Rivera saying, "No one deserves what happened to her." "It's our job to find out who's responsible and bring them to justice," he said. Police said they used DNA to identify Jurvetson after her sister recognized a photo posted of the young woman's body online. The sister, Anne Jurvetson, told People that the "free-spirited and happy" teen went to Los Angeles after meeting and becoming smitten with "John." Anne Jurvetson said her sister sent her family a postcard saying she had found an apartment and was happy but that they never heard from her again after that. Her parents never reported her missing because "they thought that she was just living her life somewhere," Anne Jurvetson said. Eventually, she said she came to realize that her sister was probably dead. "It is such a sad, helpless kind of feeling to always question, to never know," she said. "After all these years, we are faced with hard facts. My little sister was savagely killed." Manson became notorious in 1969 as the leader of a "family" of young killers that terrified Los Angeles. Manson was convicted of killing seven people, including pregnant actress Sharon Tate, the wife of director Roman Polanski. The Manson Family has long been suspected of being responsible for her murder. That does not seem to be the case as they have another man in their sites for having committed this brutal "overkill" murder. The victim was stabbed about 150 times. ◾Hair Color: Dark brown, tinted. ◾Distinguishing Marks/Features: Vaccination scars on her left arm and outer left thigh. A one-quarter-inch horizontal scar underneath her right breast. A light brown birthmark on her right buttock. ◾Dentals: Available. She had 16 silver amalgam fillings in upper teeth #2, 3, 4, 5, 12, 13, 14, and 15; and lower teeth #18, 19, 20, 21, 28, 29, 30 and 31. ◾DNA: Available at the state lab. ◾Clothing: Blue corduroy jacket (size 9-10; made in Canada), blue Levi hip-hugger jeans (made in Boston, MA), tan knee-length riding boots (possibly made in Spain) that were well-worn and re-soled, tan long sleeved sweater with perpindicular ribbing (size 32), and a 2" wide leather belt (Thom 38 or Tham 38, with one-inch leather strips which go through a brass ring. ◾Jewelry: Yellow metal ring with a red oval stone worn on the right ring finger. A white metal ring with Indian designs worn on the left middle finger, made in Mexico. A hiker found the victim's body down an embankment on Mulholland Drive and Skyline Drive near Laurel Canyon. She had been stabbed over 100 times, indicating overkill. 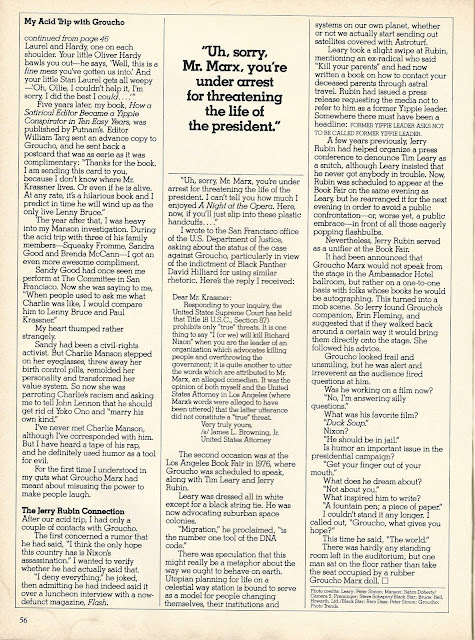 A witness remembered seeing the girl with the Manson Family at Spahn and thought her name was "Sherry." 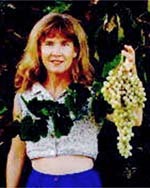 Because of the labels in her clothing, detectives suspect she may have come from Canada or the east coast, possibly Europe. 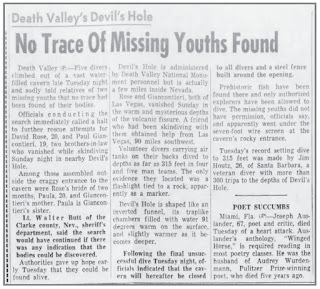 Perhaps one of the most fantastic stories connected with Charles Manson and his "Family" is that of their attempts to locate a "bottomless pit" in Death Valley where they would ride out the Helter Skelter race war brought on by their lethal Cielo/Waverly jumpstarts. 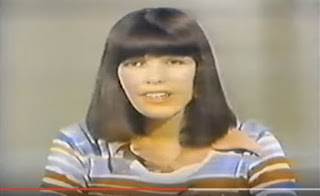 MISS VAN HOUTEN: "But we — after that, we started decide — seeing where we were in this position, because we knew that we were part of this Revolutions — of the Revelations in the Bible. We knew that we had a part in it. 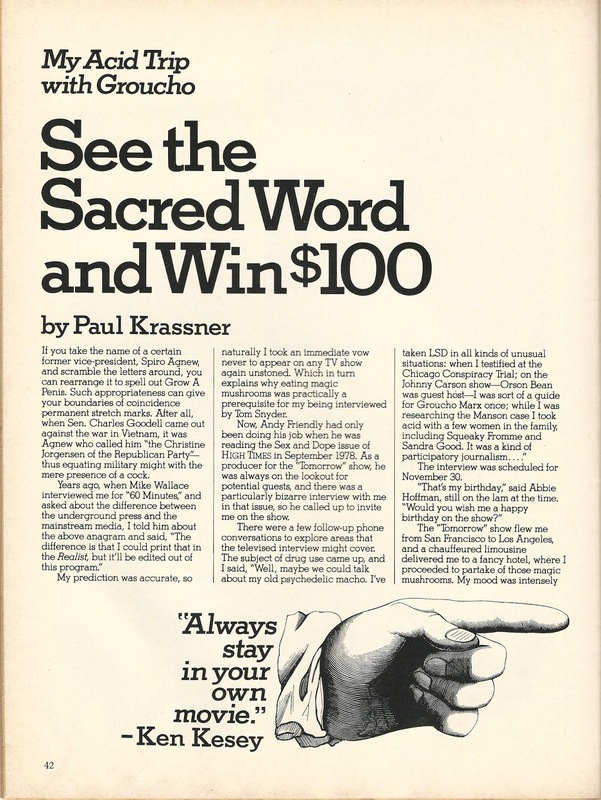 "And so we read, and it talked about a hole in the desert or going to the Kingdom. We found out — we started looking into the Death Valley, what’s underneath Death Valley, and we found out there was the Armagosa River and blind fish and all kinds of things that just made us believe that there was a whole world underneath. And that some of the Montezuma’s people are already under there waiting for us. "And that what would happen is that about a couple thousand of the chosen people — white people — would go down into the center of the earth and stay there for about fifty years. And then there would Athens or — I can’t remember all the names, but something was going to happen. And then we were going to come back up. And this was when we — the earth would be all black. 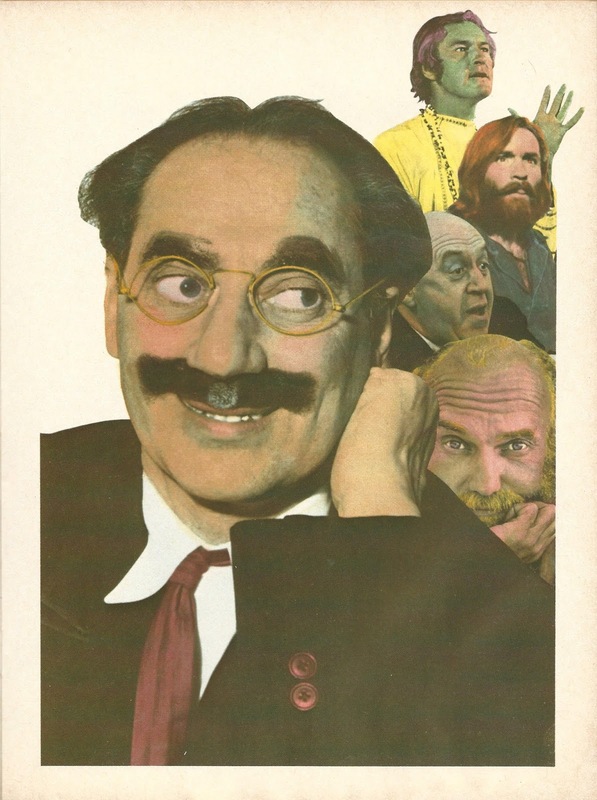 "Because to go into the hole, you would have to be perfect in your mind and in your body." MR. PART: "Now, how were you supposed to get down to the center of the earth?" MISS VAN HOUTEN: "Well, we hadn’t quite figured it out yet. We were looking for the hole. "That’s what we were doing in the desert with the dune buggies. And that’s why we needed more dune buggies. "And we were — we had a good idea that it was in the Death Valley area, but we weren’t sure just where. "And we weren’t quite — we weren’t quite sure of how it was going to work, where we’re going to get in there. "But maybe it was going to be rigged up from someone who’d gone down before, that it would have water on the top and then like the water would like move away — go away somehow by some kind of mechanism. "And if we played around the hole enough that went down there, we’d find it out. And then we could just walk down it and then we’d have to float down a river, one of the rivers, and then it would take us down and take about — I think about two weeks, we figured it out, to get down to the center. "And then once we got to the center we’d be tiny, and everything would be great big, magnified, like the pearls. "It talks about the pearls. There’d be giant pearls, and we’d be just little tiny, about maybe five inches compared to everything else." MR. PART: "You say it talks about the pearls. Who talks about the pearls?" MISS VAN HOUTEN: "At the end of Revelations, in the very last book, almost to the last page, it says that the kingdom will have giant pearls. "I don’t know who said it — I don’t know who wrote it — but it talks about that, and gold everywhere." Whence sprang this weird story of paradise in an infinite hole in Death Valley? 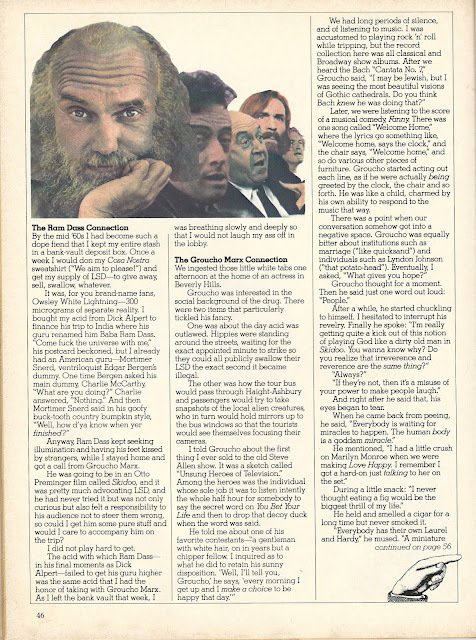 With regard to the "Manson Family" there are several supposed sources for the belief that Manson and his associates could disappear into a bottomless pit to wait out Helter Skelter. One of these sources, as mentioned by Van Houten in her Part interview, was from Chapter Nine from the Book of Revelations in the Bible, specifically, "And the fifth angel sounded, and I saw a star fall from heaven unto the earth; and to him was given the key of the bottomless pit. 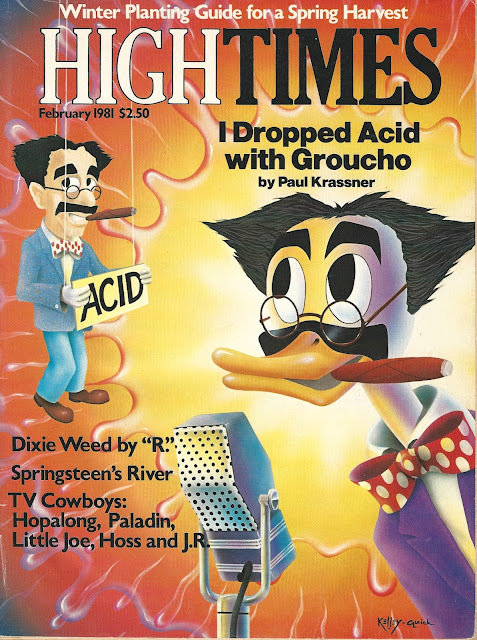 And he opened the bottomless pit; and there arose a smoke out of the pit…. and there came out of the pit locusts upon the earth; and unto them was given power, as scorpions of the earth have power…." 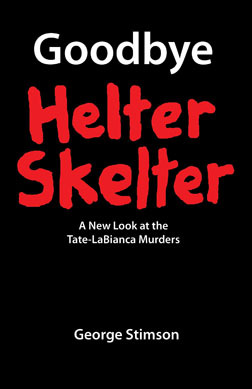 Another supposed reference to the pit and "the Family's" equally supposed obsession with it comes from the Beatles' song "Helter Skelter," the alleged anthem behind the Tate-LaBianca murders, wherein Paul McCartney sings, "When I get to the bottom I go back to the top of the slide," a lyric which, according to the prosecution at Manson's murder trial, referred to "the Family" going into the bottomless pit and then returning to the Earth's surface post-Helter Skelter. 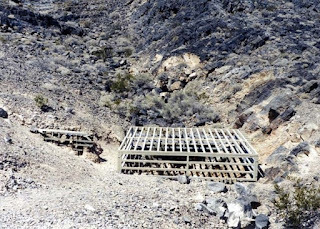 Although Charles Manson very possibly made some note of the bottomless pit mentioned in Revelation 9, he likely did so because he had already heard of another bottomless pit, namely the one mentioned in Indian and mining lore in the area around Death Valley. In his 1930 classic book Death Valley author Bourke Lee explained. "The Great Basin Paiute lived surrounded by weird, unearthly beings. They lived in the air above him and in the ground beneath him. They were in the trees, below the surface of the water, in caves and niches in the rock, on the plain and high in the mountains. The U-nu-pits were the commonest of this host of evil spirits. Most evils and mishaps were attributed to the activity of the U-nu-pits. They made their homes in the high cliffs and searched the desert for foolish and unwary people, whom they carried of to toss of the brink of some high canyon wall. No Paiute ever slipped off a high trail to his death solely as a result of his own carelessness or because a rotten path had crumbled beneath him. To the Paiute mind it was clear that the man who fell had been tripped by a U-nu-pits, or that a U-nu-pits had prepared the trail to trap him. "The Yan-tups were the evil spirits of the springs. They lived in the ground around the subterranean sources of the mountain waterholes. They came out of their deep hiding places at night and say on the surface of the water singing in low, doleful voices. The often seized little children who went to the springs for water and carried them off to hidden caverns." "Tom Wilson [was] a Charoc Indian who was a Death Valley guide in the 1920s. Wilson said that when he was a boy, his grandfather told him he had found a tunnel that extended for miles beneath the valley. Walking its length, the man ended up at an underground chamber where a race of fair-skinned people dwelt. "Welcomed by these subterraneans, Wilson's grandfather lived with the for a while. The people spoke a strange foreign language, wore clothes made of a leatherlike substance and illuminated their home with a pale greenish-yellow light of unknown origin. "The Indian eventually resurface and returned to his people, who were understandably skeptical about his adventure. But Tom Wilson believed that the old man hadn't lied, and he spent the rest of his life searching for the entry of this underground world, convinced until his death in 1968 that it actually existed somewhere beneath Death Valley." "At one point, Wilson teamed up with a prospector named White, who claimed that he too had found strange underground dwellings in Death Valley. White had been exploring an abandoned mine in Wingate Pass when he fell into a hidden tunnel that led to a series of rooms. "The rooms were filled with leather-clad human mummies. Gold bars and other fabulous treasures were stacked in piles around them. There was a passageway leading beyond the rooms as well, lit by an eerie greenish-yellow light. But White dared not explore any further, fearful of what might lie beyond. "White visited the rooms three more times, once with his wife and once with another miner. But he was unable to locate the cavern later when accompanied by Tom Wilson and a group of archeologists, although they did find a curious dead-end tunnel into the solid rock. The area around Wingate Pass was eventually absorbed into the China Lake Naval Weapons Center, and is now closed to the public." If there is a bottomless pit in the Death Valley area, where might its entrance be? 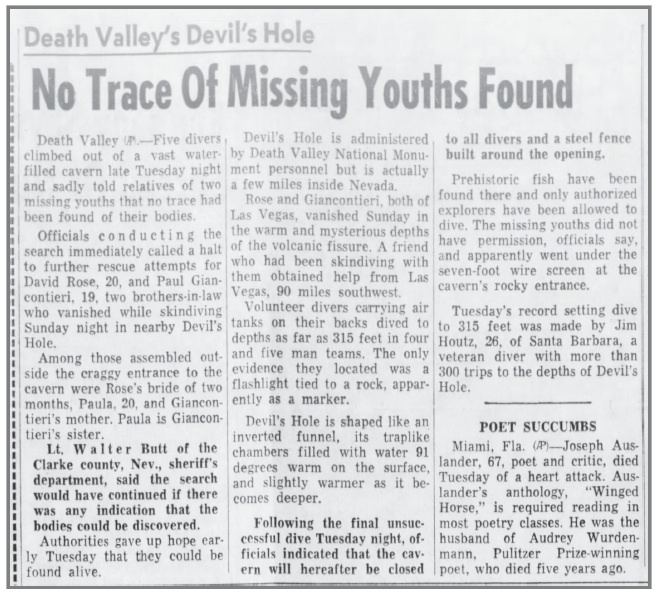 One likely candidate is the Devils Hole, a water-filled opening in the earth located about a dozen miles northeast of the town of Death Valley Junction. Although explored extensively, the depth of the water in Devils Hole has never been determined, thus making it an excellent candidate as an entrance into the pit. In June of 1965, just a little over three years before Manson et al. 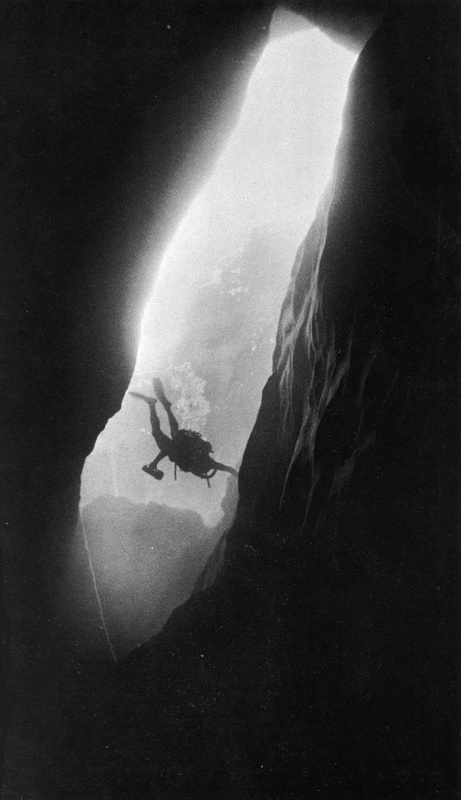 's initial arrival in the desert, three amateur scuba divers from Las Vegas ventured into the Hole for some surreptitious recreational diving. Two of them never returned to the surface, and despite a days-long search by scores of would-be rescuers from all over the western U.S., no trace of them was ever found. 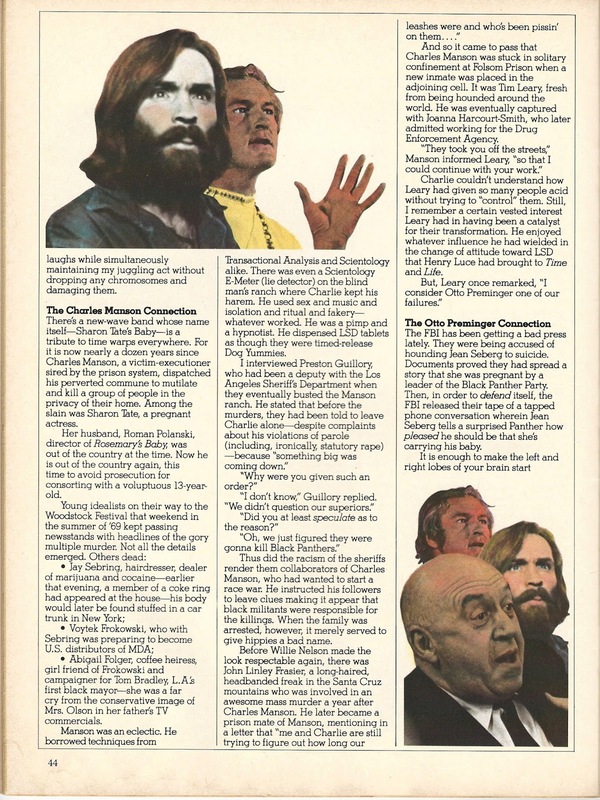 Manson and his companions absolutely knew about this tragedy, as Catherine "Gypsy" Share referred to it when she was interviewed for the June 25, 1970 Rolling Stone magazine article on "Charles Manson, The Most Dangerous Man Alive." Just a few hundred yards away from the Devils Hole to the north is another mysterious entryway into Death Valley's subterranean world, the Devils Hole Cave. The Devils Hole Cave also has no known bottom. In fact, it is not even known whether the Cave and the Hole are even connected, despite their close proximity to each other. prevent unauthorized persons from entering. 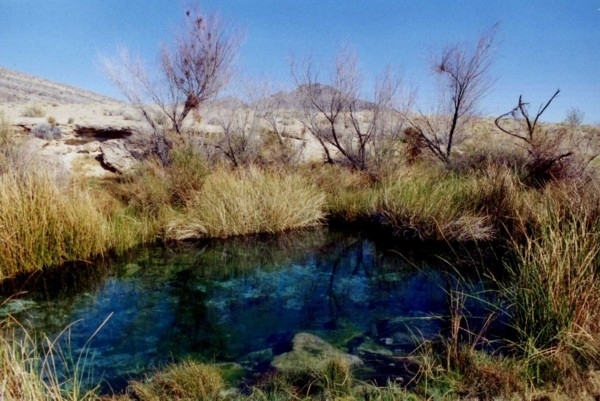 Also in the area are several spring fed pools that likewise have no known depth or origin. One of the pools in the Devils Hole area. Nobody knows anything about them either. There are hundreds of vertical mine shafts in the Death Valley area that could also lead to an underground paradise. And still another entry candidate is the "blow hole" located in the southwestern side of the Striped Butte in Butte Valley, just a half dozen or so miles from the Myers and Barker ranches. So, how would all of these legends from Indian lore and miners' stories wind up connected with Charles Manson and his "Family?" 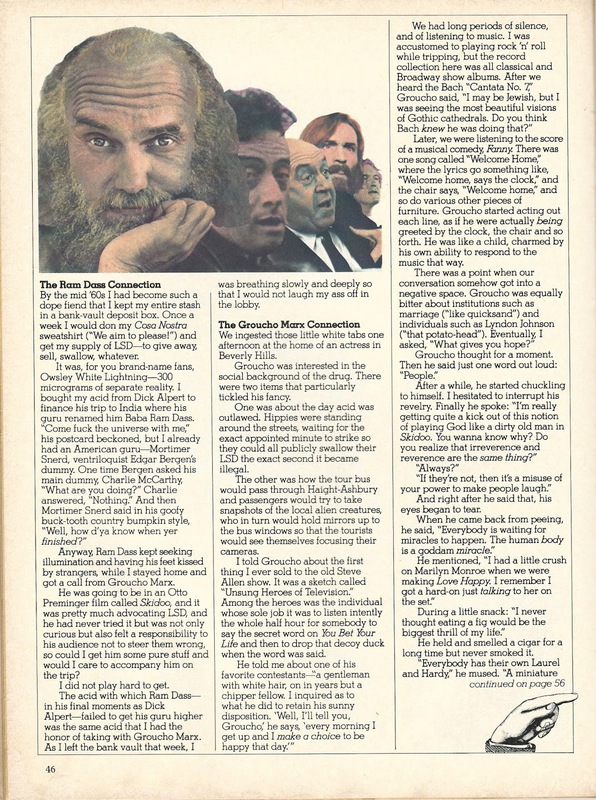 Because of his background of being raised in institutions Charles Manson is an extremely paranoid-type person, and his resulting proclivity for awareness means that he has an intense interest in anything that is going on around him. He likes to talk with people and find out what they know. 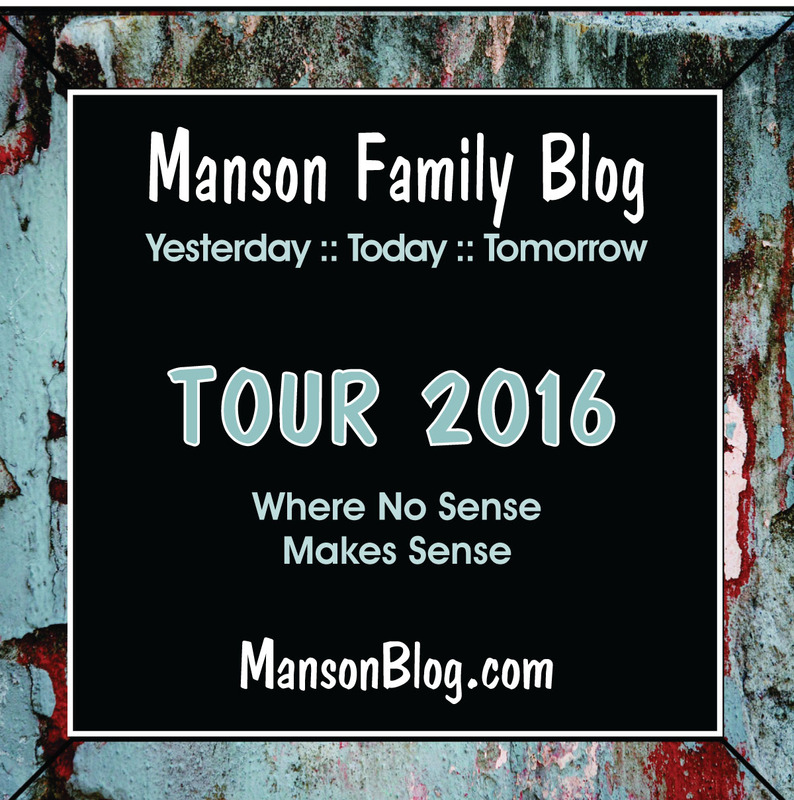 And there can be no doubt that during his time in the desert Manson spoke with as many of the local residents as he could and that he absorbed everything they told him. Thus there can also be no doubt that Manson was aware of every Indian legend, every miner's tall tale or hallucination, and every legitimate news story about anything that occurred in Death Valley before he got there. 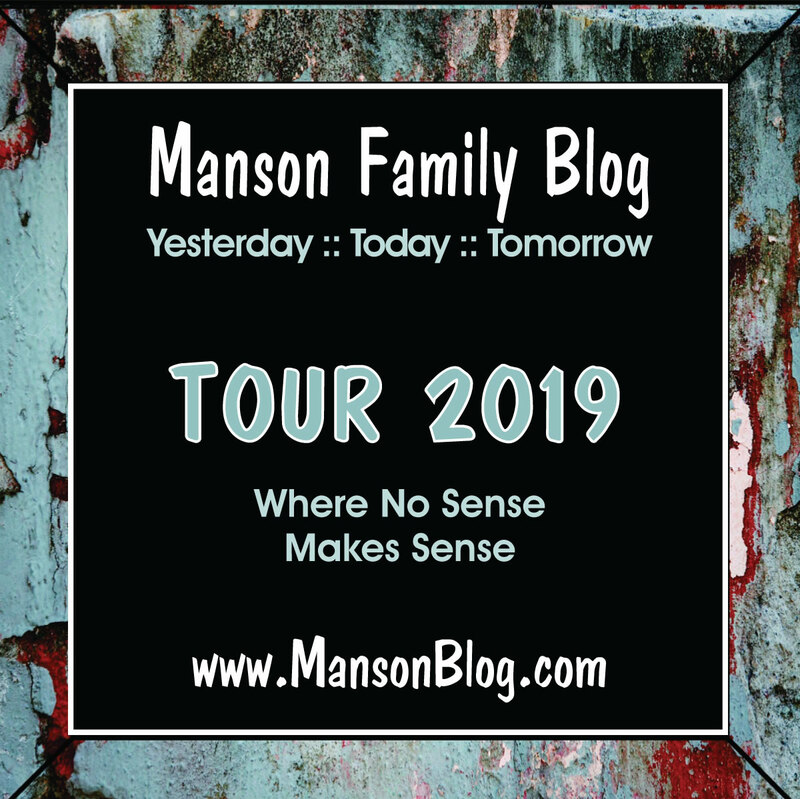 Further, Manson's interests can be infectious, especially since another of his characteristics is that he likes to point out the interests of the life experience to those around him and, if possible, channel those interests into positive energy. Therefore, I find it completely believable that Manson, upon learning of various stories about a bottomless pit in the Death Valley area, would not only communicate those stories to the persons around him but that he would also even channel them into some kind of activity for his friends to engage in, as in, "Hey, I heard that there's a bottomless pit somewhere around here. Let's try to find it!" 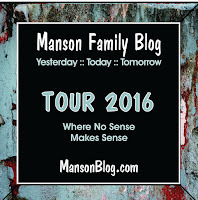 And that's where we get reminiscences of people like Leslie Van Houten who recall "the Family's" earnest search for such a hole. I don't always find Paul Krassner to be believable but I do usually find him to be entertaining! Everyone hates being burned online, even convicted murderers. 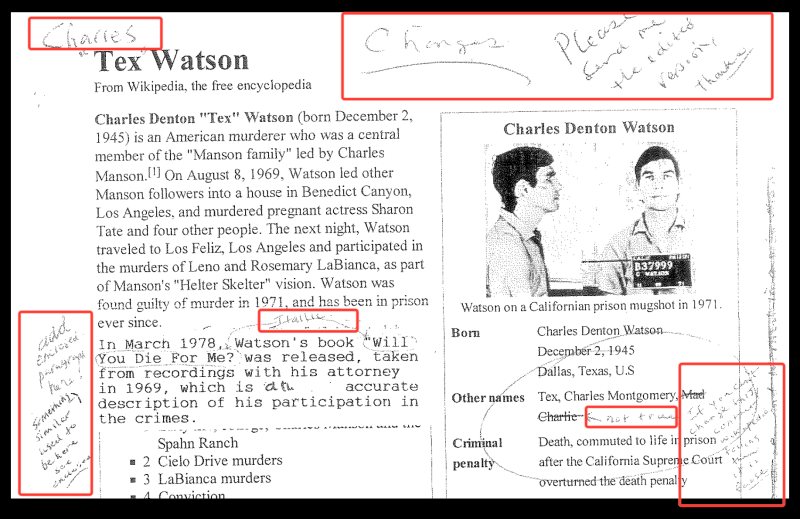 So when someone who appears to be former Manson Family member Tex Watson decided that his Wikipedia page wasn’t giving him a fair shake, he did what any currently incarcerated felon would do: Print out the page, physically mark every point of contention, and mail it in to Wikipedia. 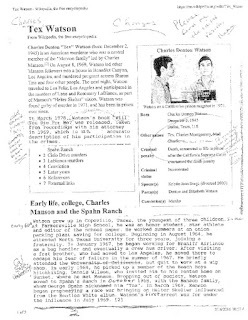 Discovered by The Wikipedian, a new section was added to the article’s discussion page this past Thursday under the heading “Edit requests.” In the addition, a member of Wikipedia’s Volunteer Response Team, tasked with answering the sites’s emails, explains, “The requested changes were presented as a printout of the 16 February 2016 version of this Wikipedia article, annotated with handwritten notes by the subject of the article. 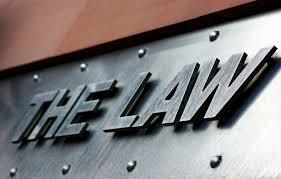 A copyright release was sent with the notes. 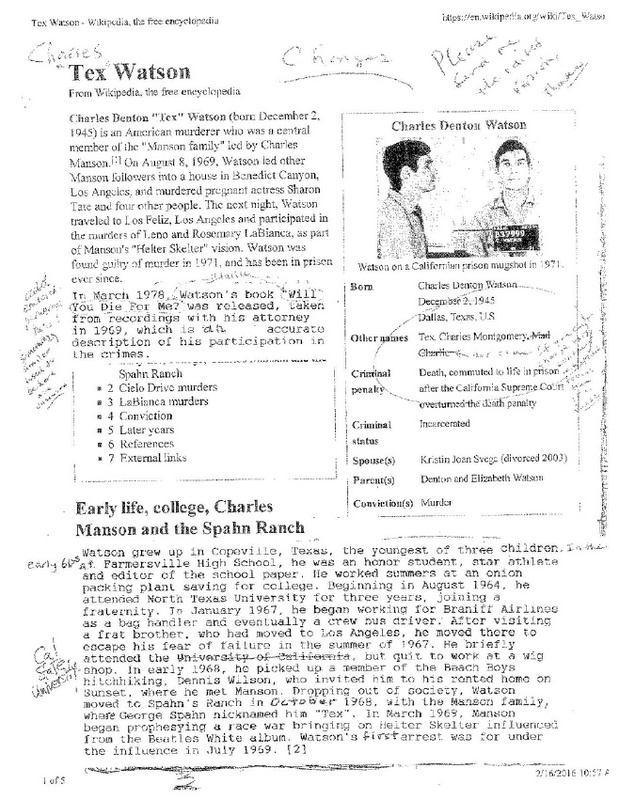 The scan of the notes is uploaded to Commons.” According to Wikipedia’s editors, the scan was from none other than the former Manson devotee himself. 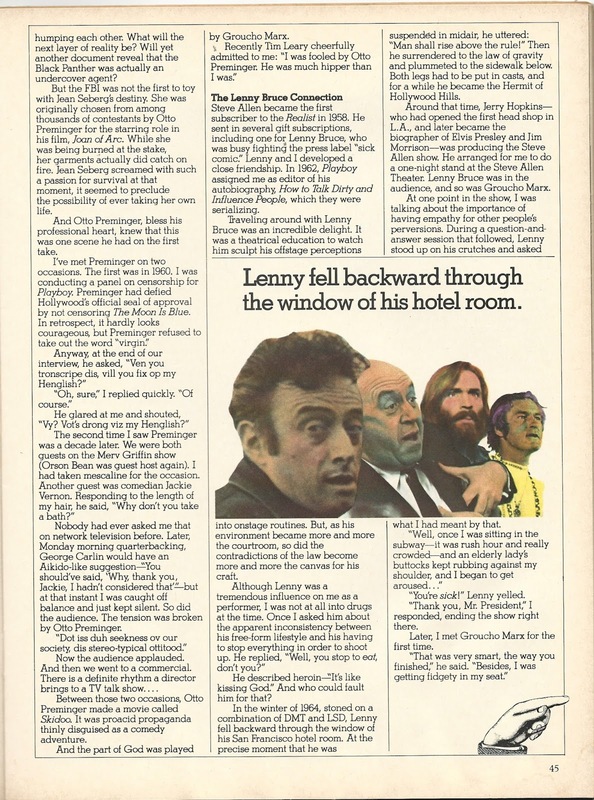 The editor also attempts to clear Watson of at least some degree of culpability in the Manson Family murders. Here, for instance, Watson seems to assert that he merely assisted co-Manson Family member Patricia Krenwinkel in killing Folger. Apparently, Tex was much happier with the previous version of the post, which not only included the murderer’s real first name (Charles) but also plugged his autobiography. 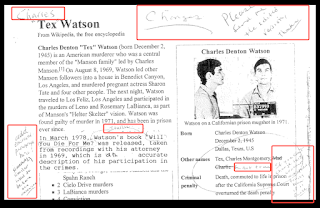 At the time of publication, Watson’s alleged edits have yet to be made. Wikipedia’s editors are, however, still in the process of discussing the submission, so that might very well change. 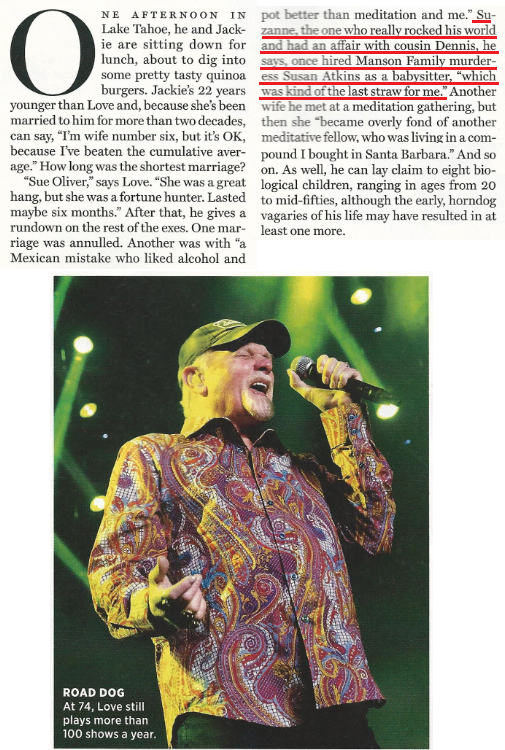 Of course, there’s no way to be certain from scans alone that Tex is who he says he is. The ticket for the request was made private by Wikipedia, and without the envelope allegedly sent from prison, it’s hard to verify without speaking directly to Watson. We’ve reached out to Wikipedia for comment and will update if and when we hear back. You can read the scanned edits in full below.